Torsion-proof pipes of various diameters. Orthopaedic engineering (prosthesis), sport equipment construction. 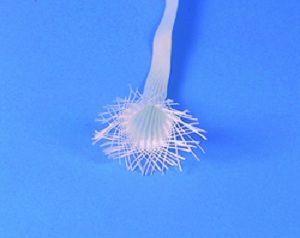 The sleeve diameter can be varied by clenching or stretching. Delivered in stretched condition. Use plenty of R&G release spray on core material (slide coating) and allow to dry. Pass sleeve over material and pull both ends for proper fit - fit under tension if necessary. Apply resin with a brush. The area to be processed can be warmed using a hairdryer if required. This will liquify the resin and impregnate the fibre quickly and safely. (Do not forget resin fumes - ensure that the room is well aired or wear a protective mask.) The core is gripped following hardening and the pipe removed. Small size components may be pre-frozen. In this way it is easier to remove the shrunken metal core. For technical reasons it is not possible to wind up sleeves in a fibre angle of 45°. The amounts of differ therefore on the length at 45°.